This is so cool! I love it, great idea! It looks so cool like that! I think they look better spread out anyway! Gorgeous mani! It never occurred to me to layer magnetic polish! It's an awesome way to expand their "useability." Looks fantastic. actually, i like that it continued to spread. awesome nails! I love this idea! I was going to bypass the magnetic polishes, but seeing this makes me rethink my decision! Hey, I'd call this a 'happy accident' sort of like Ivory brand soap (ya' know the soap that floats)! I think this looks amazing and I think NOW I'll have to give in and get some of those magnetic polishes!!! I wanted to try this! It's very nice :) Thanks for showing! oh wow that looks so cool, rather than buying all the dif magnetic colors! I sure hope I get a magnetic polish for Christmas! I need to try this. It looks a lot like feathers to me. I love it! You're a genius!!! 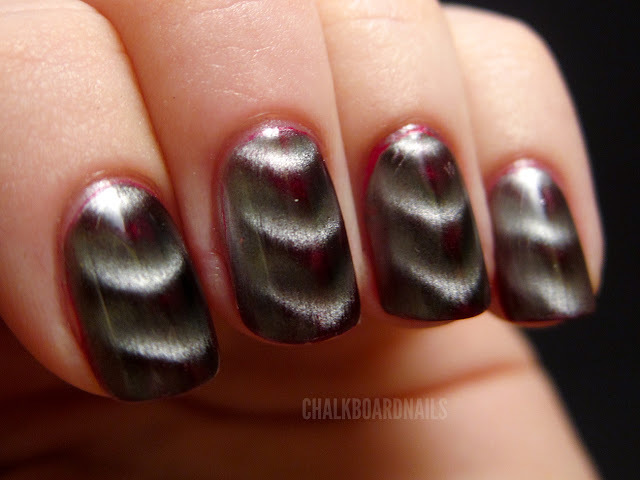 I'm not a fan of the magnetic colours... but this one I will just HAVE to try... it looks really intriguing!! Looks so cool! Love t! i had no idea it would do that. Its so thick that i never even dreamed you could put another colour under it. Bravo! Wow, what a smart idea! 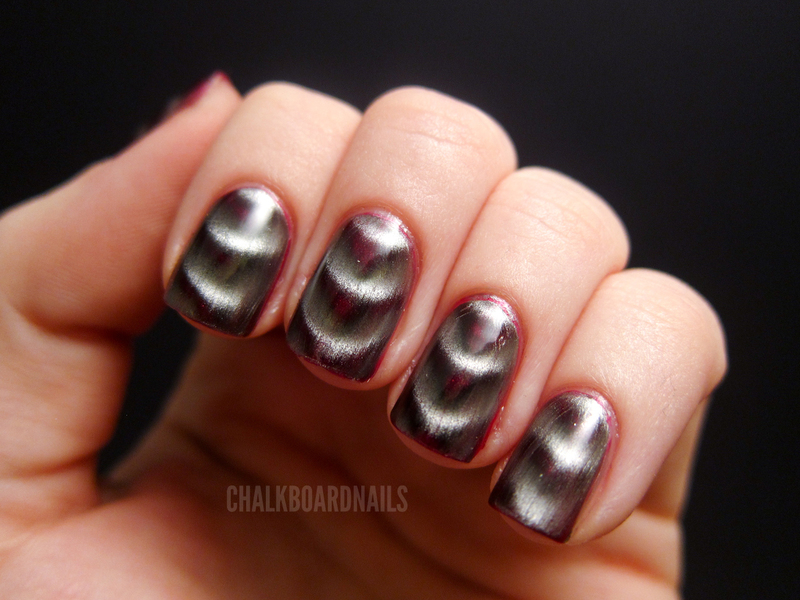 I've never heard of anyone layering with magnetic polishes. 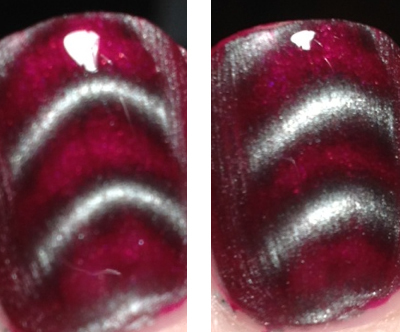 Interesting...I never would have thought to layer the magnetic polish over another color. It looks super nice, even if it gave you trouble. i gotta try this! i have this nail polish! thank you for the great idea! SOOO fun! I love it Sarah! 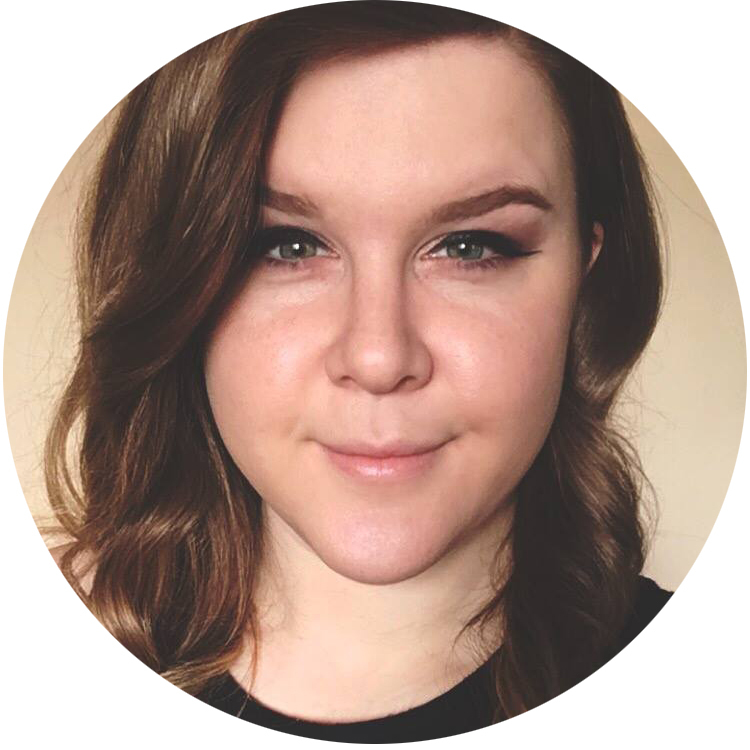 Am not sure I am loving this trend-but I do appreciate you tweeting me about the Canon-when I DO get a new one-would really appreciate some help with the settings-I'll let you know! Love the effect with the Nails INC! It's super cool what you did with the magnetic polish! I have to try that!! This is so nice! 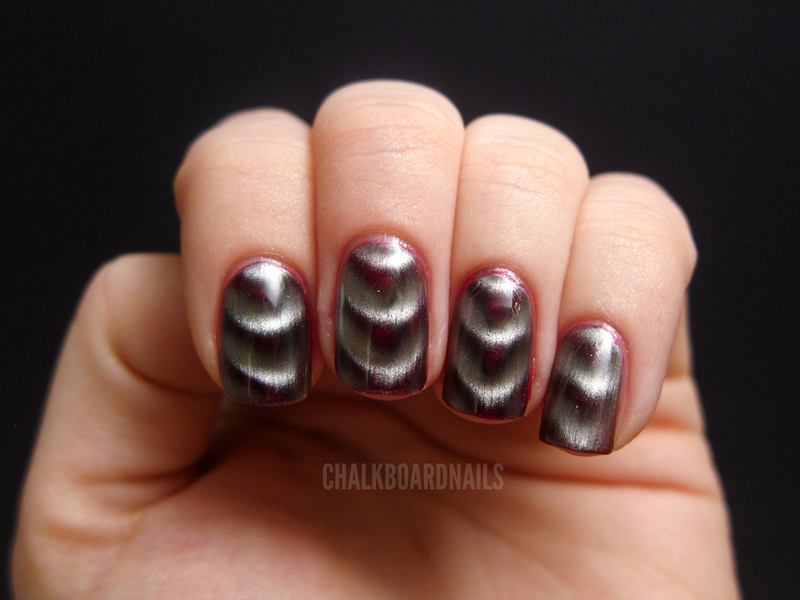 I didnt know you could do something like this with a magnetic nail polish! I'm sure to try it. I love it! thanks for showing this! it's GORGEOUS!!!!! layering magnetic polish is my new favorite thing EVER! there are so many different combinations I want to try now! It does tend to work better if you use a shimmer/foil/glitter base color, though. for example, I tried to make a teal with silver effect by layering a gunmetal mag. over a teal cream polish- in the end you could see the iron particles too well (b/c they didn't blend into the bg color at all) and it just looked kinda dirty.